So many of our clients have wonderful ponds on their properties or have a lakeshore property on the edge of a lovely lake. Slowly, year after year, a common problem is the accumulation of muck and silt. This muck can make swimming unpleasant and wading into the pond or lake as inviting as trying to salvage a wristwatch that has accidentally fell into the outhouse dry toilet pit! Kids don't want to swim, the muck is thick and stinks....what happened to my lakeshore? Why is my beach now a place mainly for insects and birds? Removing sludge and muck from ponds and lakes can be time consuming and expensive. Traditional methods like dredging, pond excavation or suction harvesting are expensive and can cause significant physical intrusion to aquatic systems and wildlife. Using specifically designed muck removal bacteria and enzymes can reduce muck, silt and sludge at a fraction of the cost. Pond Muck Pellets are the newest and fastest way to eat up bottom sludge. Unlike traditional bacteria which spreads throughout the water column and mainly focuses on nutrient reduction to remove algae and clear up green water, the pond muck pellets sink into the muck where they are scattered and start devouring muck on a localized area. A potent blend of micronutrients for lake and pond treatment. pellets have a slow release and sink down into the muck to deliver essential biostimulants, activated barley and bacteria. They penetrate and degrade your pond muck and sludge by stimulating existing bacteria and by adding sludge-eating cultures. Format: 30 pound pail Easy to apply. You can treat the entire pond or only in the areas that muck tends to accumulate. Super Dose: For ponds or lakes where they would like to degrade up to 1 foot per month. Feed 50 to 60 lbs per acre once per month. Temperature Range: Works best when water temperature is 60° F (17°C) to 130°F (54°C). The warmer it is the faster they reproduce and digest sludge. Professional Pond Muck Pellets safely reduce muck and sludge from ponds and lakes of all sizes and muck from swimming areas. Large Pond and Lakes To remove muck in a large pond or lake, to provide a complete treatment, broadcast the pellets evenly at a rate of 125 pounds per surface acre. Apply between two and four times per year depending on problems and desired rate of muck reduction. In smaller ponds apply approximately 3 pounds per 1000 square feet of surface area. Ponds & Lakes: 125 pounds per surface acre (44,000 square feet) per month. These professional-grade pond pellets biodegradable pellets contain sludge-eating bacteria, enzymes and trace minerals to not only get rid of the muck but also to enhance the quality of water. Product is completely safe for fish, frogs, pets, birds and humans; use with complete confidence that your pond or lake is being properly taken care of without harmful chemicals. These professional pellets naturally eliminate that disgusting odor-causing muck on beaches that sticks to your feet and makes swimming unpleasant. Spot treat your swimming areas today and a clean beach and shoreline will be yours tomorrow. These pellets are easy to use and are Ideal for campsites, recreational parks, private beaches or anywhere that a natural clean pond bottom is required. Using the professional pellets means you can easily reduce sludge levels in ponds and lakes without the use of heavy equipment. Typically you will see reductions of 5 inches per year of organic muck and sludge sediments. This can be increased with higher application rates and the addition of aeration and complementary bio-augmentation. Unlike some other pellets these professional ORB-3 pellets have no gypsum fill so you only pay for active ingredients for optimum results. To remove muck in a large pond or lake, to provide a complete treatment, broadcast the pellets evenly at a rate of 125 pounds per surface acre. Apply between two and four times per year depending on problems and desired rate of muck reduction. In smaller ponds apply approximately 3 pounds per 1000 square feet of surface area. These pond muck removal pellets were designed for lagoons, lakes and ponds as a low-maintenance solution for sludge bed and solids removal, water clarity and beach cleanup. 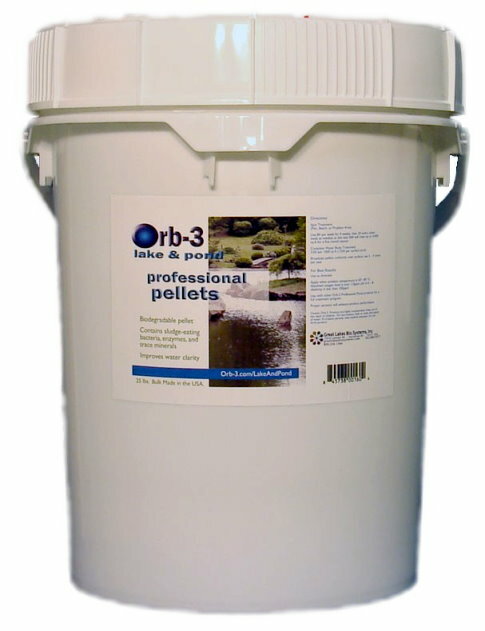 Great Lakes Bio Systems have designed the Orb-3 Professional Pellets to be fortified with specialized bacterial strains that are high volume waste consumers of muck and organic matter. These Professional Pellets combination of natural technologies is a simple cost-effective method for continuous sludge management. This product cannot ship to Canada. Adding aeration to your pond or lake enhances the natural ability of your pond to avoid the buildup of organic muck and sludge. To learn more about how aeration can help stop the buildup of muck and sludge see our pond aeration page. Retention Ponds: Retention ponds start out nice and beautiful and after a few years they become loaded with floating organic matter and muck. MD Pellets are an easy way to help balance them out and reduce muck. These pellets will also work well in retention ponds that may have a lot of road salt. A biologically cleaned pond is a happy pond. A mechanically cleaned pond can often be unhappy for some time as it tries to find biological balance. Golf Courses: Golf courses can get a lot of muck due to runoff, high nutrient loadings, and leaf and grass waste. MD Pellets are an easy and affordable way to keep golf course ponds free of muck and more importantly to help keep them biologically balanced. Shorelines: Used by homeowners to reduce muck around the shoreline. Just sprinkle some pellets around a dock once a month and let them sink into the muck. Month by month the lake bottom will clean up. Many customers have called them little vacuum cleaners as they see the muck reduce. Aquaculture: Used to degrade fish poop that accumulates in the bottom of a pond. MD Pellets have proven to be economical and efficient for fish farmers who want to minimize muck accumulation as an alternative to dredging. Reduces dredging The pellets are a dense product designed to be “tossed in” and sink to the bottom. When they sink into the muck the bacteria produce enzymes that speed up the breakdown of organic waste. Some customers have expressed success breaking down sycamore leaf debris in their lakes and ponds using MD Pellets. They contain safe and beneficial bacteria, and will not harm aquatic species, fish, waterfowl, or people. This product will also reduce sulfide and mercaptan odors found in muck. Application Rates & Dosages: Initial Spring Dose or Shock Treatment: Add 2 gallons All Season Liquid Bacteria per 100,000 gallons of pond volume. Note: Ponds currently on regular bacteria programs or not showing signs of problems may begin with the Maintenance Dose. This is a Green Source product meaning it contains all natural, "green" ingredients that are non-toxic, biodegradeable and eco friendly. 4. "Is your pond muck out of control? Is it time for a pond cleaning but you just can’t figure out how to accomplish it? Often times pond muck and lake sediment are the result of millions of tiny clay particles that are in a “colloidal suspension”. How can you tell if your pond has colloidal clay particle suspension, if it is just muddy from rain and runoff, or if you have dead organic vegetation built up over the years? Step 1. Take a 2-3 gallon sample of water from the pond or lake. Step 2. Get an empty 5 gallon bucket and put a cloth (we find an old t-shirt works quite well) over the top to use as a filter. Step 3. Pour the cloudy, mucky water from the full bucket onto the cloth covering the empty bucket. If the water goes through the filter and the cloudiness is filtered out, you most likely have dead organic vegetation. Dead vegetation can be broken down by raking and turning up the sediment and “muck” at the bottom on a weekly or bi-weekly basis. 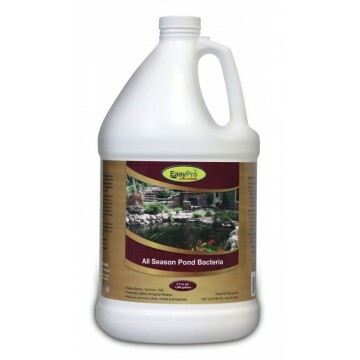 You can also use a beneficial pond bacteria product to speed up the biodegradation of the dead weeds, algae and leaves that have built up over the years. (Note: beneficial bacterial and aquatic weed killers may counteract each other.) ." 5. "In the bowl area live the anaerobic bacteria, which cannot decompose the incoming matter quickly enough. This bacterial war rages on and the fallout is methane, sulfur dioxide, phosphates, and other toxic gases saturating into the water column reducing oxygenated water for fish and other aquatic species. This MUCK is nutrient rich and creates a deteriorating cycle. In essence, instead of the aerobic bacteria feeding the planktonic kingdom, and continuing a natural, healthy food chain, the anaerobic bacteria disrupts this natural process and feeds the plant kingdom, increasing algae and weed growth and suffocating the pond. Natural springs and aerators help, but eventually even they lose ground to this natural process. We at SRS use a hydraulic method of pumping the MUCK, from the bowl areas. It is an extremely clean and cost-effective way of removing the sludge and toxic gases without the use of heavy equipment. It also does not interfere with the existing wild and aquatic life, which presently inhabit the pond. Once the bowl areas are cleaned to their original bottom, the toxic gases are removed with the MUCK, greatly enhancing the water clarity and quality giving your pond a fresh new start as it was in the very beginning. Due to the high volume of sediments removed per day, we will require a discharge area on site to discharge the sediments to, such as a wooded area or fields that flow away from the pond. The sediments will not mound up, but will flow and seek its own gravitational level. It is excellent fertilizer and will not harm grasslands or wooded areas. The pump used can reach 200 feet into a pond and discharge back up to 2,000 feet, depending on elevation and grade. For those of you who do not have an adequate discharge area, there is an alternate way to contain the muck. We are having remarkable success cleaning ponds in this manner and are sure we can be a valuable service to you. Please contact us with any questions you may have. ."